Originally published in the July 2015 issue of the News from Native Plant School Newsletter. For the most part, each milkweed species has its own horticultural/environmental requirements with a couple exceptions…common and marsh milkweeds tend to be more generalist in nature and can grow well in a variety of soil types including clay. They tend to spread easily in most gardens. Here is a species by species breakdown of milkweed species that are available commercially in Missouri. Common milkweed needs elbow-room as it is an aggressive suckering perennial growing 3-4 feet tall. Its flowering stems are often widely spaced. It normally grows in tallgrass prairies, along roadsides and at the edges of corn and soy fields. It is at the center of the current controversy with roundup-ready corn and soybeans. James Trager states that this species is the most preferred milkweed by monarchs laying eggs. It’s fragrant flowers also attract a wide variety of pollinators and predators looking to ambush pollinators. Performs best in full sun but may tolerate partial shade. Marsh or swamp milkweed is a clump-forming perennial growing 3-4 feet tall. It is a wetland species and so can tolerate poorly drained clay soils with low oxygen and flooding. It is an ideal rain garden plant. It’s copious display of flower clusters attract a wide variety of pollinators and predators looking to ambush pollinators. Monarchs frequently lay their eggs on this species. In dry soils expect it to be short-lived. Performs best in full sun and moist soils. Butterfly milkweed is a clump-forming perennial growing 2 feet tall. It grows in dry prairies, roadsides and gardens with well-drained soils. Many gardeners report having poor success growing this species. 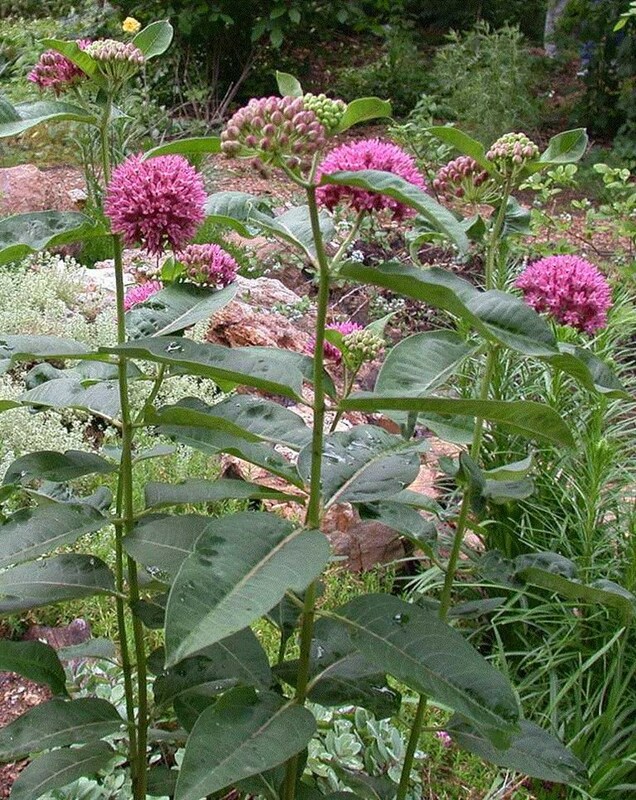 It is also one of the top butterfly and pollinator attractors and is the number one choice of milkweeds by gardeners. Performs best in full sun and dry soils. Purple milkweed is a clump-forming woodland perennial growing 3 feet tall. It grows in open woodlands and occasionally prairie and glade edges. It is also sought-after by gardeners for its fragrant purple flower clusters. It is also one of the top butterfly and pollinator attractors. Performs best in light shade and dry to average soils. Green or spider milkweed is a clump-forming perennial growing 1-2 feet tall. It grows in dry prairies and roadsides. It has the largest flowers of Missouri-native species with greenish-yellow flowers and purple speckling. This is a lesser-known species among gardeners but well-worth considering. Performs best in full sun and dry or rocky soils. Whorled milkweed is an aggressive suckering perennial 1-2 feet tall in full sun. It colonizes rapidly…less so in part shade. Its flowering stems emerge densely from the ground, hence the other common name, horsetail milkweed. 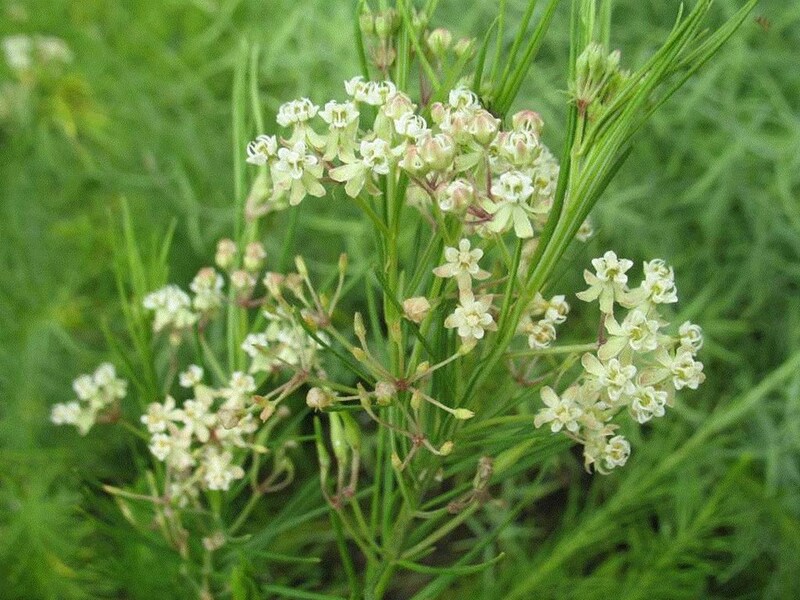 Its stems are upright with narrow leaves and tiny greenish-white fragrant flowers in clusters along the stem. This plant is often considered aggressive by gardeners but is difficult to find in local nurseries. Performs best in full sun to part shade and dry to average soils. Sullivant’s milkweed is a suckering perennial growing 3-4 feet tall. Its flowering stems are widely spaced, appearing by surprise 5-10 feet away from parent plants. It grows in wet prairies. Its appearance is similar to common milkweed but it’s not as aggressive. Flowers are pink with salmon-orange tones. Leaf mid-veins are pinkish in color. Performs best in full sun in wet to average soils.